Jill Guerra, Research and Special Projects Coordinator at COTA presented participants in POGI’s May Stakeholder Teleconference call with a pre-publication preview. We are pleased that the full report is now available to the public. 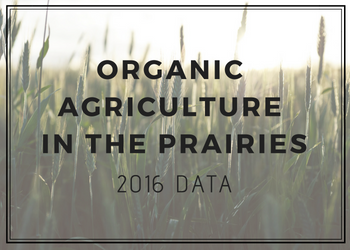 The 3rd annual edition of this report was created in response to the demand for organic sector information specific to the Prairie provinces. Providing data and analysis allows businesses to proactively plan, take advantage of opportunities and anticipate supply changes. Access to better data not only supports policy and programming that facilitates development and growth in the organic sector, it also informs the allocation of resources such as funding or technical assistance to ensure that support is appropriately targeted. Whether the information is used for educational programs, supporting policy and programming efforts, or for private sector business planning, the report is a welcome and useful resource. Data from the report is also used by the Prairie Organic Grain Initiative and the provincial organic associations to improve their programming, business planning and policy work. The report can be accessed on the Pivot and Grow website: http://www.pivotandgrow.com/blog/resource-download/organic-agriculture-in-the-prairies-2016-data/. Pivot and Grow, a program of the Prairie Organic Grain Initiative, provides farmers with the resources and support needed to begin growing organically, improve their production practices, and market their organic enterprise successfully.